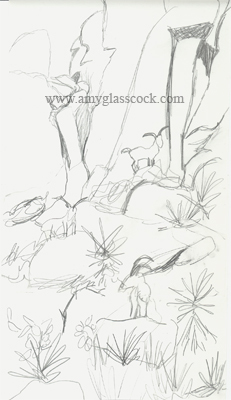 I am going to paint some sheep that look like mountain goats that I saw in Ft. Davis, Texas last Thanksgiving. I started painting the rocks today. I added the mountain sheep today. 3.17.2011 >>> Happy St. Patrick's Day! I began battling with the grass today! More work on the grass and the foliage in the background. I worked on the front sheep mainly today and a bit on the middle sheep. I worked on the yucca plants- the one in the foreground and the second one in the middle of the painting. I added more yellows and more contrasting dark brown. I worked on the middle goat today. I started changing the rocks today. I continued working on the background rocks and I started to work on the foreground rocks. The middle one is a bit too dark right now but I will fix it soon. I also changed the color of the sky... though I might change it back. I worked on the sky more by adding more manganese blue but I still don't like it. I also worked on the colors in the rocks. More work is definitely needed. I changed the sky again. I added some cobalt blue and white and tiny bit of dark brown and I like the color better. I also changed the rocks in the background to more orangey browns and added more dark reds to the shadows of the rocks. I also started adding more white to the grass and defined the grass more by the center rock and also in the back. I should finish this weekend... hopefully. I added some more yellowish brown to the rocks in the background. I worked on the goats more today. I changed the color of the middle rock today. I worked on the color of the rocks more today.